Like the body, I hoped to buy a basic neck with the fret slots cut and appropriately finished. But there are a lot of choices which need to be made. A neck is the most intricate part of a guitar and the detailed work needs to be done by experts, which I am not, unless the title of expert can be conferred on someone for eating lots of Doritos. Anyway, apart from color and finish which are basically subjective choices, the main choices I made which seem worth discussing are neck shape and fretboard radius. Most modern Fender guitars come with a 9 1/2″ radius fretboard, though other dimensions are occasionally available. This means if you were to look at the fretboard in a cross-sectional view, the top surface of the fretboard will look curved and if you were to continue this curve, it would describe a circle with a radius of 9.5 inches. You could think of the whole neck as being the edge cut from a cylinder of wood 19 inches in diameter. Here is a diagram (from Fender) to help explain. This is a neck cross section. Here is my Clapton Stratocaster neck, a 9.5 inch radius neck. The standard stuff you hear people say is that smaller radius necks are better for chords, especially barre chords (obviously) and larger radius necks are better for bending. I have no idea if I could even tell one radius from another while playing so I thought I’d try something different with my neck and ordered a compound radius neck. This is a neck whose radius varies, being smaller at the top of the neck and larger at the bottom. Is this the best of both worlds? Or a horrible compromise? We’ll find out. In my case, I chose a 10″-16″ neck. Whereas I previously suggested thinking about a neck with a single radius as the outer slice of a cylinder of wood, the compound neck equivalent would be the outer slice of a cone, a conic section. Anyone remember their high school pre-calculus? The other big choice I made was to go with a “soft V” neck. 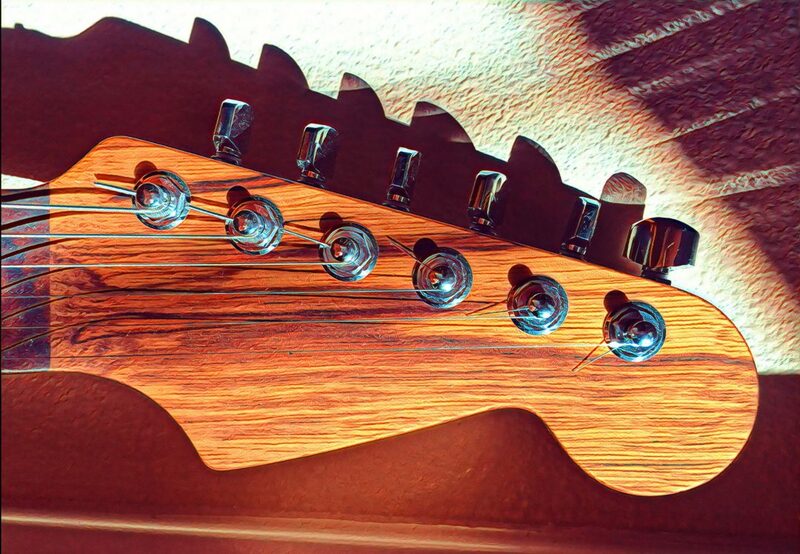 Unlike the radius, which refers to the fretboard side of the neck, “soft V” refers to the back of the neck. My Custom Shop Clapton Strat has a soft V neck and I really like it so I thought I would try and duplicate it. The term “soft V” doesn’t sound very technical to me so I imagine there is a lot of variation in what one can expect. So yes, this is a gamble. Here is a picture which attempts to distinguish a soft V from other neck shapes. Take the dimensions and pseudo-preciseness with a grain of salt – this is just for explanation. Apart from this, I chose a maple neck with a rosewood fretboard because I like the look. The neck will be finished with a satin finish, to keep it smooth and fast. Pics when I have ’em. Do all Fender necks have the same width? They do however the telecaster and stratocaster necks have differently shaped heels. The Telecaster is squared and the Strat is curved. The string width and nut width do vary though. Also the number of frets on the neck varies too.